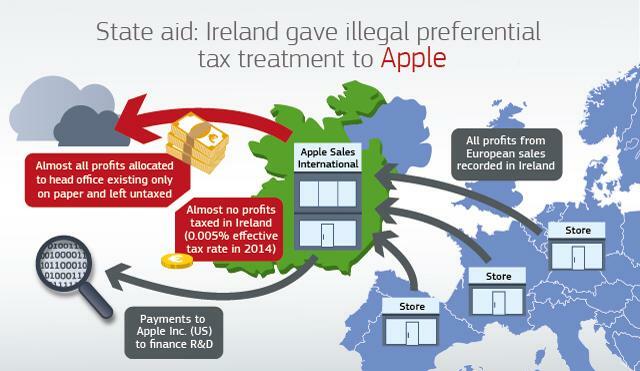 Maybe you heard: Apple owes up to €13 billion in back taxes, plus interest, to Ireland. And maybe you also heard that Ireland doesn’t want Apple to pay. So what’s up? In short: members of the EU can establish their own tax systems; the EU doesn’t have any authority over those systems. Over the last two years or so, though, the EC has been looking at special tax deals member countries have been giving to companies; where it finds that a country has provided special tax treatment to one particular company (and not granted similar tax treatment to other companies), it has held that the country provided “state aid” to that company. The EU treaty prohibits state aid and, when a member country provides such aid, the EC can require that country to recover the taxes it should have collected from the company in question. Though this Apple ruling is the most recent, last year the EC determined that Luxembourg and the Netherlands had used tax rulings to provide state aid to Fiat and Starbucks, and it is still looking into tax rulings provided by Luxembourg to McDonald’s and Amazon. And what specifically did Ireland do that constituted state aid? According to the EC, the problem was a transfer pricing one. Transfer pricing is setting a price for goods and services between related entities, and the governing principle is that prices charged between related entities should be arm’s-length. That is, when Apple Sales International licenses IP to Apple Operations Europe, it should charge an amount that it might reasonably charge a third party. The arm’s-length standard is an artificial, and difficult, standard. As a result, countries will often provide advance pricing agreements to companies. These agreements are basically comfort letters, telling the company that the taxing authority views the prices it intends to charge as satisfying the arm’s-length standard. The EC is fine with advance pricing agreements in general. Here, though, the EC said that a 1991 and a 2007 agreement between Apple and Ireland had no factual relationship to the arm’s-length standard, and therefore represented state aid. As a result, it ordered Ireland to recover the roughly €13 billion it found Apple to have underpaid. Tim Cook, CEO of Apple, is not happy. He argues that the EC’s findings have “no basis in fact or in law.”Apple and Ireland both intend to appeal the ruling. Even if they succeed in their appeals, though, the ruling will be expensive for Apple. In a state aid case, the EC can order a member country to collect ten years’ worth of back taxes, and, even if Ireland appeals (which is says it will do), it must collect the back taxes, though it can put them in an escrow account pending resolution of the appeal. undermines the international tax system. There’s something to these objections, especially the first and second together. Arguably, taxing authorities shouldn’t collect retroactive taxes on novel legal interpretations. On the other hand, why would the U.S. Treasury Department care about that? Treasury’s concern is that if Apple or other affected firms are required to disgorge to Ireland or Luxembourg the taxes they should have paid, but didn’t, then those firms will turn around and claim those disgorgements as foreign tax payments that reduce their U.S. tax bills. Specifically, Treasury is concerned that Apple will claim a foreign tax credit for the $14.5 billion (under the current exchange rate) it owes. In Apple’s case, though, I suspect that Treasury’s concern is at least moderately overstated. Why? Because Apple U.S. isn’t going to pay the disgorged profits; rather, Apple Sales International and Apple Operations Europe, which both appear to be Irish corporations and subsidiaries of Apple U.S., will. Which means that Apple U.S. can’t take a direct foreign tax credit for taxes paid; rather, it must take a deemed paid credit. Basically, that means that it can only take a foreign tax credit for taxes paid by its subsidiaries when those subsidiaries pay a dividend. Now, I don’t know the last time Apple repatriated money, but it’s sitting on somewhere in the range of $181 billion offshore. And, at least under the current tax regime, it currently has no intention of bringing that money back. So at most, if the U.S. were to treat the disgorged amount as a creditable tax, it would allow Apple to repatriate some amount of money tax-free. While that would ultimately (probably) reduce U.S. revenue, it’s not clear by how much or when. In fact, if Apple were absolutely resolute about not repatriating ever, there would be virtually no revenue cost to the U.S. government. The EC’s use of the state aid doctrine to attack tax haven countries’ advance pricing agreements may or may not be sound policy. But, from a U.S. revenue perspective, it probably has limited impact. [fn1] Like, for example, here, here, here, here, and here. Posted on August 30, 2016 by Sam BrunsonPosted in International Tax, Tax PolicyTagged apple, ec, eu, foreign tax credit, ireland, state aid, transfer pricing. Next Next post: Court Says No to Uber Class Action Settlement: What does that mean for worker classification?